The FJR, Yamaha’s sport tourer, was first released overseas in 2001, and arrived on U.S. asphalt in 2003. Since then, the bike built for on-road adventures has undergone a handful of evolutions. The latest, for model year 2016, is one of the most significant thanks to a new six-speed transmission, with a tall top gear for low-rpm highway hauling, and a new easy-to-handle assist-and-slipper clutch. 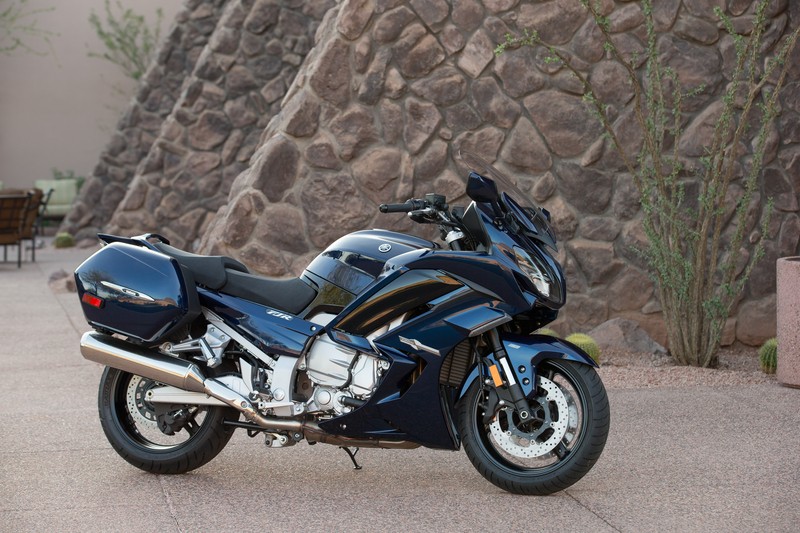 Available in two models, FJR1300A ($16,390) and the FJR1300ES ($17,990), we tested both during a two-day jaunt in Arizona and discovered the 2016 is steady, predictable (in the best sort of way), and ready to go all day and night. First things first: The transmission overhaul delivers a great benefit to riders on big tours with a large load, who like to hang out at high speed, and who are just looking for seamless shifting. First and second gears were made taller, while fourth and fifth were built shorter, with no change to the third. Six gear is a tall gear — you can comfortably cruise at 100-plus mph in fifth, but Yamaha claims cruising in sixth will equate to a 10 percent reduction in rpm. This, in conjunction with the new helically cut gears, make an already smooth ride even better. The bike also received an aesthetic facelift, resulting in an FJR that looks more modern. The new clutch increases ride quality because it reduces lever pull by about 20 percent. That’s possible thanks to a full redesign. Out is the old single-spring mechanism that required more oomph to initiate, and in is the new three-spring design that reduces lever pull by 20 percent. Wet, the FJR weighs in at about 635 pounds. The difference between the A and the ES? The latter has the electronically adjustable suspension system and LED cornering lights — illumination that adjusts while turning to light up where you’re heading. The former has manually adjustable suspension and traditional LED lights. We cruised the hills above Jerome, Arizona, which is worth a quick stop at a minimum, if only to check out the wine-tasting room from the vineyard owned by the Tool frontman, or what might be the basketball court with the best view on the planet, on the ES. With more than 84 suspension settings, the ES is ideal for riders who want to fine-tune preload, compression, and rebound as much as possible and do it at the touch of a button. The ES also has ABS. As far as braking goes, the FJR has two brake discs in front and one in back. But if you just step on the brake pedal, one of the front discs engages. 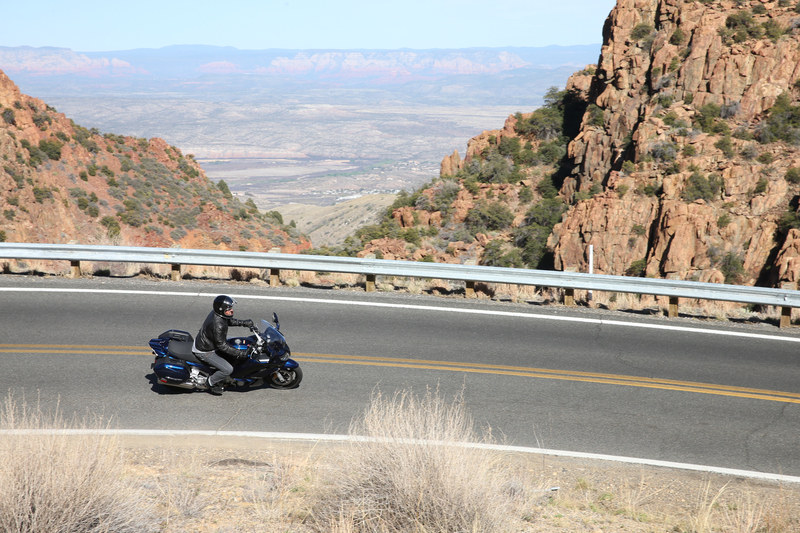 Some riders may find the seat hard, and for these folks, Yamaha offers a softer option, which we didn’t try, because even after 250 miles, we were comfortable. Hard saddle bags that lock are stock, 60 liters each, but will not accommodate a full-size helmet. Fuel economy is respectable — about 45 mpg — and with a 6.6-gallon tank, you can cover some serious distance before needing to fuel up. The FJR also includes a glovebox with a 12V outlet, which is ideal for charging your phone, GPS unit, or heatable clothing. Heated grips with three levels are also stock and surprisingly easy to get used to on cool mornings, and the windscreen easily adjusts. And you can raise or lower the seat, too, but you’ll have to hop off to do it.